We’ve helped many small businesses set up websites over the last decade – it’s one of the first concrete steps most businesses take to create a public presence. Typically, the process begins with purchasing a domain name and (far too often) setting up email using an email server provided by the host. Unfortunately, this leaves your business email open to the fluctuations and downtime of the hosting provider. In this post, I am going to discuss why we now advocate that all of our customers and clients move their email hosting to G Suites for Work, which we feel is the best email service for business, along with an advanced tool for efficient online collaboration. The number one reason to switch from self-hosted email to G Suites is the Gmail interface. Basically, you’re getting Gmail for business. Many business people have a background that includes managing email on Microsoft Outlook. If this is the case, it may feel as though moving away from that software and into a hosted solution will disrupt your workflow. I was one of these people before we made the switch several years ago, and having come through the process I want to make this very clear: YES, it will be disruptive, but only for a few days – then, once you get used to using search and tags rather than a tree of nested folders, you’ll find that your efficiency goes way up! When I began using Gmail for our business, I tried to recreate the nested folder logic using tags. It was hard for me to understand that the search feature could provide the same level of organization without having to do the upfront work of tagging. For instance, when you want to find an email sent to you by Jane Doe, you enter her name into the search field, which will auto-populate with her contact email. Hit enter and all the emails from that contact appear in the list. Now, if you want to narrow the search to a few topics, simply add the topic after her email in the search field and hit enter again. Now the list of emails is narrowed to a handful and you can easily select the one you want. The basis of the G Suites platform is super-stable, hosted email using your own domain name. If you don’t have a domain name you’ll want to register one with Bluehost. They offer the cheapest best quality hosting and domain services in the industry. When you go to setup your G Suites apps account, you’ll be prompted to enter your domain along with some contact information. Once the account is live, you’ll need to update your DNS at Bluehost (just follow the simple directions provided by the G Suites setup wizard) and create your first users. These users will be assigned an email like name@yourdomain.com, where the name is replaced by their username and yourdomain is replaced with the business domain. Security is a big deal and the advanced security options that come packaged with G Suites are one of the reasons I feel it is the best email program for businesses. It seems like every day we hear about a new hack or breach that’s compromised personal or financial data. You shouldn’t have to worry about whether or not your company’s correspondence and stored data is vulnerable to exploitation. G Suites offers two-factor authentication so you can require that all users in your Apps account assign a secondary authentication method. This ensures that passwords alone are not enough to break into your users G Suites email or storage. It takes only a couple of minutes to set this up, and you’ll never regret the peace of mind you get with this service. 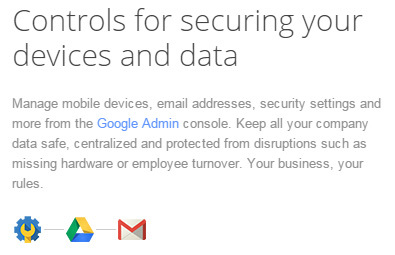 Storage: Each G Suites account comes with a service called Google Drive. Google Drive acts like an online backup of your desktop files that you can then access from anywhere. Depending on how you set it up, Drive can also act like a shared server that provides shared access to files across your entire organization. Office Tools: Most businesses use the office tools bundled in the Microsoft Office suite, and while I don’t advocate getting rid of your Word and Excel quite yet, I do believe that you’ll find you’re using them a lot less once you see the powerful collaboration made possible using Google Drive’s office tools. Drive comes with a word processor, spreadsheet, and presentation utility that is nearing MS Office in quality and feature richness. But the things that really make tools shine is the ability for multiple users to be working on one document at a time, as well as enabling quick previews of PowerPoint presentations, PDFs, docs, and spreadsheets. Calendar: Over the years, we’ve tried just about all of the business calendar options on the market and none rival the Google Calendar in its simplicity and functionality. You can quickly share calendars across users in your organizations and create complex recurring events, in addition to inviting people to events and using Hangout for conference calls, which we’ll look at next. Chat and Hangouts: Chat and Hangouts are the communication wave of the future and depending on your industry, may be the communication preference of the now. We use Hangouts constantly when working with contractors and clients and use chat to shoot quick notes among our team when phone and email are too involved for the task. Hangouts are video calls that also integrate chat, screenshare, drawing and other collaborative tools during the call. PLUS, you can include up to 15 people (!!) on the call at no extra charge. As a startup business, cost control is likely to be a major consideration. G Suites for Work handles this by having you pay for only the number of users you need at any one time. Each user costs between $5-$10 a month and you can add or drop them whenever you add or release human resources in your business. 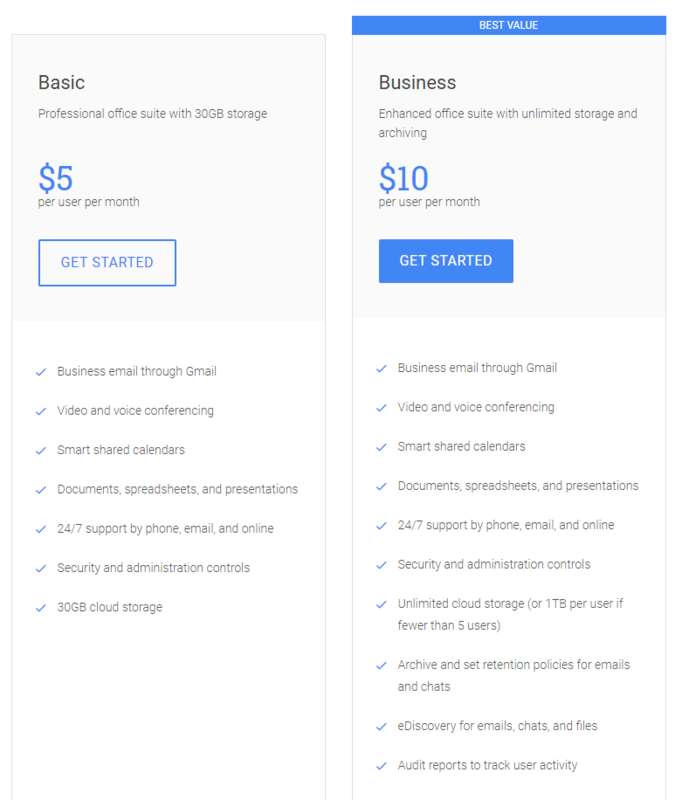 At the $5 level, you get pretty much all the tools you need to launch your business, along with 30GB of email and Google Drive storage per user. For many startups this will be plenty of storage, but if you are going to be working with lots of images, video, CAD files, PDFs or other large resources, I strongly recommend looking at the $10 unlimited storage level. At this level, each user will get 1TB of storage unless you have more than 10 users, in which case they all truly have unlimited storage. In addition, by upgrading to the unlimited level, your account will include Google Vault for eDiscovery, which means all emails sent by all users within your domain are stored in a digital vault for you to audit if the need should arise in the future. You will need to purchase your company’s domain name before signing up. Contact me at googleapps@nimbusthemes.com for a G Suites promotion code. Recently I worked with a client that was creating a presentation slide-deck that would accompany her on a speaking tour about her area of expertise. When she originally sent the deck to my firm is was in the form of a PowerPoint presentation which is a common file-type that works with Microsoft’s office suite. Unfortunately, it’s a major drag to collaborate on a PPT file as you end up having to send the physical file back and forth or try to combine two versions after both parties are completed. I suggested to the client that we get her business set up with G Suites for Work not only because it’s the best email service for small businesses like hers but also because we could then collaborate on a Google Slides project instead of the dreaded PowerPoint. The client was thrilled with the email services she was able to access with her G Suites account and she and I were able to both work on the Google Slides project at the same time while Gchatting up a storm and jumping on the occasional Google Hangout. Such an improvement!! Hi, I recently started a photography business, and I am simply researching which would be the best email to use with it. I currently have a regular email with google, but I was considering if it might be best to use something that looks more professional for the business like a “.com” email. After reading the information here about the google apps for work, I think this might be the choice I’ll consider. Anyhow, looking forward for the coupon to get started. Thank you! Thanks for your comment, we appreciate it. I’ve sent you a promo code via email – please let me know if you didn’t get it and I’d be happy to look into it. Hi there! We are small organisation with 6 employees. Considering GoogleApp solutions for the email communication. Hello I recently launched a online family resource website and I think this would be great to look more professional with the .com. I also like how I would be able to designate other users as well and share documents, videos with one another. Thank you and looking forward to discount code. I’m looking to transfer my companies domains off of Go Daddy and to a different domain name provider that offers Google Apps for Work accounts for email. My company is relatively new and are trying to get into the Green Building Construction consulting market. I think that Google Apps will help us communicate and collaborate better than we are currently with IBM Notes. My small team is highly mobile, spending most of our time networking or visiting customers. Google Apps lets us stay in contact and manage schedules and sharing of work and critical information to keep the team coordinated without having to all gather in place and attend meetings. I love that we can all work together regardless of the device or operating system we are using to access the system. My husband is starting his own law firm and we are looking into email options. We’ve heard good things about google for business. We plan to sign up pronto. Thanks for the info and the promo code. Pure Brawn is my online natural supplement shop I am bringing to life as we speak. We will sell natural supplements, and soon we plan to have our own line of all-natural supplements. The gmail apps will give my business the professional look and the ease of use to get tasks done with less confusion. We will use the gmail apps to collaborate with others as well as video-chat all while using the professional looking email address and apps Gmail has to offer. I love gmail, and think they will be the best option to trust with our growth. Great to read your article. Thanks it helped me a lot to choose the best email provider. I am going to start a LED manufacturing company and i am sure getting google apps. We are engaged in construction materials, our salesman are highly mobile visiting sites and this is the perfect solution for us to in order to collaborate important informations such as orders of customers. Im starting my own lawyer’s practice. To be in touch with clients on ongoing basis is a must. Your app may help to achieve this goal! I’m an artist solopreneur with an online teaching program. I’m having all kinds of problems with my host-provided email. Lots of spam that doesn’t get filtered out by SpamAssasin, while gmail has no problem identifying it. And when I try to set up a vacation auto-responder, my auto-reply goes out to all those spammers getting me blacklisted as a spammer myself, which I’m surely not! So I’m starting to look into Google Apps for Work. Would love a promo code. Hoping I’ll be able to set up multiple addresses (or aliases for what are now multiple addresses) on a single user account (info@, support@, myname@, etc.). We are Online FoodTech Startup Based in NB, Canada. We are in the business since last 2 months and now taking it to online. It would be great to have Google Apps support our work. Thanks! We have long had our default e-mail forward to a gmail account because of the ability to manage our e-mails better with GMail. The email that comes with our website doesn’t filter anything and trying to leverage it on mobile devices is difficult at best. As a business with just two employee’s being able to properly manage our digital correspondence is a huge deal and can save us hours. Hello, we’re a start-up that’s developing a B2B SaaS tool and our current hosting provider’s email user interface is very bare bones. We need migrate our emails to Google so that there is a central place we store our documents, are able to communicate with one another seamlessly, and to foster collaboration on the team. I appreciate it if you could share your promo code w/ us and help an emerging start-up out! Wow, it’s really opening my mind. Can’t wait to try it out. We are still at beginning stage of setting up our Start-Up; hope this is what we are looking for. Please help us by sending your promotional code to us. Really appreciate this awesome opportunity which you are providing to us. Thank you! I am starting a new creative firm combining the market strategy skills of my business partner with my design and branding skills. We have both experienced trouble with crazy domains emails so in starting this new business we wanted to go for security and stability. I had already done a little bit of research on google apps and was impressed and your post was confirmation. Looking forward to getting started with it. I have a manufacturing firm and I still use the simple gmail as the official email for my company. I have strongly felt the need to get a proper business email client . And what can better than gmail for business. Looking forward to start using it soon! Starting a consulting and educational technology business. I want to use Google for Work, since it looks professional, and gives me the tools I require at this stage. It also seems scalable. Thank you for your article. I’m in the process of starting a consulting business and researching which professional email tool and document support will be the right for our business. Currently working in a packaging field and I can see that working with Google Apps will help our company grow out of our traditional ways and become more tech-friendly. Running an online store for light products. Regularly need to communicate with both customers and suppliers. The standard email application that comes with hosting is not enough anymore. Hope that gmail for business provides a next step forward. Hello Bill, thanks for reaching out. I’ve sent you a promo code via email – please let me know if you didn’t get it and I’d be happy to look into it. Still in the Start-Up phase of our new venture and in need of a separate business gmail address to separate us from our personal accounts. Google Apps sounds like the way to go. Thank you, Evan, for your research. You’re welcome! I’ve sent you a promo code via email – please let me know if you didn’t get it and I’d be happy to look into it. J, sent you a promo code – enjoy! We are startup company and specialize in IP business. We have recently started moving our email hosting from our service provider to Gmail. Biggest advantage is its customization & its drive option. So far our 2-3 users are using Gmail server but soon our entire team would be using Gmail. Its fast, convenient & its add-ons attract our team. David, thanks for reaching out. I’ve sent you a promo code! Best of luck. Very informative article. Very early stages of setting up an e-commerce for husband and I’m starting a bakers website. We will definitely use Google Apps for both of these ventures. Thank you! I have a new startup and think Google Apps will be a huge help! Gail, I’ve sent you a promo code via email – please let me know if you didn’t get it and I’d be happy to look into it. Best of luck! Hello, I have a wedding stationery website and recently have been searching around to change over my emailing. I am looking for something that can link desktop & mobile emailing since currently I am working with one that does not show my response if I reply on my phone on my desktop. Quite frustrating. This sounds like a great option and can tie together with my personal email as well. Looking forward to the coupon! Christy – I’ve sent you a promo code via email – please let me know if you didn’t get it and I’d be happy to look into it. Hi, I’ve been in business for 10 years now, and email has always been an issue. I currently have my work email filter through gmail, but I often forget to switch the account to my business account when I’m replying to clients. Plus, I have to have to pay for email at my domain host company, which is not expensive, but not a great solution either. I’ve looked at Google Apps before but been overwhelmed. I’d love some help in moving my email over to something more reliable and spam-free. Lisbeth, I know exactly what you mean when you say you forget to switch the account 🙂 Happens to me all the time as well. Thanks for your comment, we appreciate it. I’ve sent you a promo code via email – please let me know if you didn’t get it and I’d be happy to look into it. Mahmoud, Thanks for your comment, we appreciate it. I’ve sent you a promo code via email – please let me know if you didn’t get it and I’d be happy to look into it. We are a local start up brewery in the KC, MO area. We are looking to find an email and business solutions service that can manage daily operations along with long term strategy implementation – while keeping everything organized. We’re trying to determine the most efficient system to use and Google Apps seems like something that can be flexible yet dynamic enough to meet our needs. Looking forward to seeing what Google can do for us! Ray, thanks for your comment. I’ve sent you a promo code via email – please let me know if you didn’t get it and I’d be happy to look into it. Best of luck with your business! SOunds like a great option for email , would like to get it for 10 accounts…however price is high….look forward for an offer! Fernando, thanks for reaching out. I’ve sent you a promo code. Have a great day! Good and informative article. I think it would be beneficial to add some of the other providers that would go with google apps such as Insightly. Thanks for the article again. I work for a small NGO working for education and disaster relief in Pakistan. We are looking to maintain our organization’s professional while also upgrading our online infrastructure, and we think Google Apps would be a neat fit for that. Moiz, Thanks for your comment, we appreciate it. I’ve sent you a promo code via email – please let me know if you didn’t get it and I’d be happy to look into it. Best of luck with your endeavors. I’ve started a consulting business and am looking for a good email solution as well as web hosting. You have sold me on Google! I think it’s perfect for my business. I look forward to receiving the promo code. Thanks! Jessica, Thanks for your comment, we appreciate it. I’ve sent you a promo code via email – please let me know if you didn’t get it and I’d be happy to look into it. Best of luck with your business. Our website is not live yet, as we don’t have our first product in stock. We are a husband and wife team and we’re trying to start our own retail business. I am a graphic designer so it’s been fun and tricky at the same time. Add two small children on top of that and you’ve got a big mess on your hands. It’s been fun and we’re learning a lot. Trying to figure out who to host our email and there’s a lot of choices. I’m seeing google is the best and you’ve confirmed. I’d really love to save a few bucks if possible! A husband and wife team, just like Nimbus Themes 🙂 I’ve sent you a promo code via email. Best of luck with your new website! We have a site up announcing our official launch in January. This app seems to be a perfect feature to update our subscribers. Ton, I’ve sent you a promo code via email – please let me know if you didn’t get it and I’d be happy to look into it. Best of luck with your business and its launch! My company develops clinical trial management solutions for the healthcare industry. We’re growing and need a corporate email service. Our research and your article have convinced us that Google is the way to go. Thanks! Kate, Google Apps *is* the way to go! Glad to help. I’ve sent you a promo code via email – please let me know if you didn’t get it and I’d be happy to look into it. Best of luck with your business! We are currently hosting our own email on an exchange server however we are now looking to outsource this and would ultimately use Google Apps to completely host our email for the company. The cost factor seems pretty high with outsourcing to a 3rd party email provider in addition to having concerns such as trusting their service, reliability, security…etc. Google would be a top contender on my list for meetings those concerns, however we would need to have about 25 different email accounts (some of those having multiple aliases) which at the 5/10 per user per month would add up. So am now doing research to see which would be my best options with out crushing my budget…. SC I’ve sent you a promo code via email – please let me know if you didn’t get it and I’d be happy to look into it. Husband and wife business, just like ours 🙂 Best of luck. I’ve sent you a promo code via email – please let me know if you didn’t get it and I’d be happy to look into it. Thinking about switching over to Google Apps for Work but the price is holding me back. Also curious how all of my old emails will be transferred to my new account. Looking forward to checking out the code from you. I appreciate it! Amy, Thanks for stopping by, we appreciate it. I’ve sent you a promo code via email – please let me know if you didn’t get it and I’d be happy to look into it. Here is what a quick search yielded on how to import your old emails: http://www.cnet.com/how-to/how-to-migrate-to-gmail/ Hope that helps! I am starting an immigration advice agency in New Zealand. I am in the process of developing a website and looking into business email. Google Apps sounds like the way to go. Thank you so much for your article and making the process of starting a company ( a long, exciting, overwhelming and daunting one) a bit easier. Hope the promo code works in NZ. Mariska, I’ve sent you a promo code via email – please let me know if you didn’t get it and I’d be happy to look into it. Best of luck with your new business! Hi, great read. Thank you. We are using go daddy accounts for business e-mail but we have tons of problems all the time. Looking for fast switch to much better e-mail provider on a long run. We need 3-4 unlimited accounts and 5 limited. Hope you can send suitable discount code. Irena, Godaddy email is quite a pain! I’ve sent you a promo code via email – please let me know if you didn’t get it and I’d be happy to look into it. Brad and Kelee – Thanks for stopping by! I’ve sent you a promo code via email – please let me know if you didn’t get it and I’d be happy to look into it. I currently use outlook, but I need something with more security. Could you tell me how Google Apps differs from Outlook? Patrick, thank you for reaching out. I’ve sent you a promo code via email. Please let me know if you don’t receive it and I’d be happy to look into it. We’re looking for a decent email provider for a new business in motorcycle racing parts. Google Apps appears to be the best thing going at the moment, and from personal use with Gmail, I can’t fault Google’s execution on being an email provider. Great article. Hi, and thanks for this comments section. I am looking for a reliable email system with good storage and communication capabilities across the internet. What better way to achieve this for a new business than Gmail for work! I am starting a new business in real estate and would love any assistance with start-up costs. Angie, Thanks for your comment, we appreciate it. I’ve sent you a promo code via email – please let me know if you didn’t get it and I’d be happy to look into it. Hi, I just wanted to say that I enjoyed reading this article. I felt it was very informative. I am a new attorney in the process of setting up my own law practice. At this stage in the game, I have the LLC filed, a domain name registered, and now need to find a safe and reliable e-mail server for the business. My partner and I both have personal gmail accounts, but recently her account was hacked, so, when considering gmail for business, we were both a little wary, as we felt security and the ability to store and maintain client files may be an issue. But after reading your review, I feel my confidence has been restored and now, I plan to use gmail business. Thanks, again. Jrw, Thanks for your comment, we appreciate it. I’ve sent you a promo code via email – please let me know if you didn’t get it and I’d be happy to look into it. Thanks for the article! As a small business looking to expand, we are looking for ways to keep cost down and productivity up, as well as reliable service. The more I research, Google seems like the way to go. Carolyn, , thank you for reaching out. I’ve sent you a promo code via email. Please let me know if you don’t receive it and I’d be happy to look into it. Best of luck! “Wechange” is a small consultancy firm focused on agile methodologies and process improvements in software organizations. We are experts in DevOps, Automation and Scrum. Would you know if google charges user fees also for aliases that simply direct to an existing mailbox? Tommy, thank you for reaching out. I’ve sent you a promo code via email. Please let me know if you don’t receive it and I’d be happy to look into it. We are a digital pathology (medical imaging) startup in Waterloo, Ontario, Canada. We are looking for an integrated solution which can provide email/calendar/apps/storage. We also have a lot of image data which would allow us to take advantage of the unlimited storage features. It would allow us to replace our current email server as well as our shared network drive, and perhaps we wouldn’t have to keep buying so many hard drives. Andrew, thank you for reaching out. I’ve sent you a promo code via email. Please let me know if you don’t receive it and I’d be happy to look into it. Best of luck! I have a small trucking company, and need a professional email address. I had an outlook email and they have terrible customer service, did not want to help fix the error message that came coming up. So, here I am! Magon, Thank you for reaching out. I’ve sent you a promo code via email – please let me know if you didn’t get it and I’d be happy to look into it. Best of luck! I am still in the planning phases of a brand new artistry company. I’ve started back-filling my FB with information, albums, etc…in order to prep in advance for my company’s opening. I would like, however, every part of this company to start out with a professional appearance and safe environment. Thank you so much for your article and the offer of a promotional code. Blessings. Melanie, Thank you for reaching out. I’ve sent you a promo code via email – please let me know if you didn’t get it and I’d be happy to look into it. Best of luck with your new company! Me and my teammates are currently working on our college project and it is a 3 months long project. We are being tasked to form a company and work with various stake holders involved, thus we are looking at various options to try and create a company domain email address, and i happen to chance upon your site. I read through your article and greatly appreciate the time taken to describe in detail. I would be grateful to you it you are able to allow us to save a small portion of our funds through your promo code. Samuel, Thanks for reaching out. I’ve sent you a promo code via email – please let me know if you didn’t get it and I’d be happy to look into it. Best of luck with your project. Hi, I’m just setting up a freelance marketing and social media communications business and need to start using a professional email address. I’m also interested in the cloud storage and support offered by google apps. I would certainly appreciate any promotions. Thank you! Phillipa, Thanks for reaching out. I’ve sent you a promo code via email – please let me know if you didn’t get it and I’d be happy to look into it. Best of luck with your new business! Great information. I am looking for email service for a small business. After reading your article, I think google app will be a great choice! life doesn’t have to be this complicated, and I’m pretty computer literate, configured the DNS , MX records in minutes! I did wonder how were the members of my team supposed configure their emails if I couldn’t get it to work…. SO QUESTION IS WHO ELSE? Thank you so much for the information. It’s very useful for me at this moment as I am setting up my own CPA firm right now. A great email service is so important for the day-to-day business and I am so glad to find this post. I look forward to the promotion code and thank you so much for sharing! ED, =Thanks for reaching out. I’ve sent you a promo code via email – please let me know if you didn’t get it and I’d be happy to look into it. Best of luck with your new firm! Thanks very much for the overview. I’m in the process of buying a family member’s manufacturing company, and the first thing I want to do is drag it into the 21st century by purchasing a domain and setting up business email — what a concept, right???? This is a much more convoluted process than a mere 10 years ago, and your article greatly simplified things, making for an easy decision. Oh, and any help with defraying start-up costs is *always* appreciated!!! Hi! I am starting a photography business and am looking for all of these services. How delighted I was to find an “all-in-one” I look forward to exploring all of the functionality. Thanks! Hi! I am Kathryn Godwin from Quoc Pham Cycling Shoes. We sell handcrafted leather cycling shoes and are looking to give our business a boost by using your email service. The email service we are using right now is slow and not very reliable. Gmail for Business suits all our business needs. I am very excited to start using this service. I’m exploring email service providers for my consulting business and am unsure about Google – I hate the idea of giving the company more information about me, my company and my internet habits. I’m also concerned about my clients’ privacy and the sensitive information I’ll be receiving through email. Is Google Apps secure and private enough? I recently moved into IT consulting services domain and I am trying to setup a small team. I have been using Google Apps for business in my earlier stints as an employee and I have always been a fan. It gets you started immediately and have all the desired tools to take your business to a logical level. It would be great to have the coupon to get things started for my own consultancy. Shall look forward to hearing back from you. Thanks for your comment, we appreciate it. I’ve sent you a promo code via email – please let me know if you didn’t get it and I’d be happy to look into it. Best of luck! THanks. I am interested in moving my email for my small business to google. Thanks for the info. I use google email, drive, etc all the time personally. Now, I’m starting up a small business to do web sites and programming for companies. I plan on using Google Apps for Work as my email provider, file server, etc as I love the functionality and flexibility it gives. Thanks. Great article! I’ve recently begun the process of starting a small business dealing with Estate Liquidation. With my background serving families as an aspiring funeral director with a mortuary science degree, the one aspect of the process never discussed is what to do with all the stuff left behind when a loved one dies! I figured if I could create a company that would ease this transition in dealing with the estate of the deceased, then I’d be better serving my community. I hope to use Google Apps to launch my business email and figure out hosting ideas soon! We are searching for a secured email service to handle our 50+ email accounts. 2. User friendly and popular GUI-Most people are used to it being gmail users. 4. Flexibility of having some of your employees with Google Mail and others with existing service. My team and I have a new startup. With everything going fast for us, we need to start collaborating better. 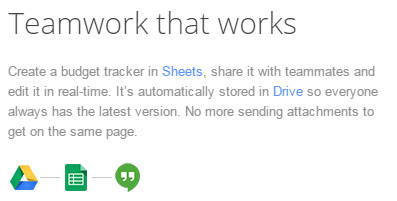 Since all of us have gmail so google apps is a better choice for now but with a promo code, I think it’s a no brainer. Thank you! As you and your company have also done, our company helps international brands launch and build a brand presence in the US. Their online presence is the greatest priority and the full breadth of Google Apps’ programs is just what we need to make that happen without worrying about third-party downtime. I will be starting a business for manufacturing electrical items. I want to have my business mail on Gmaik. Hi please can i get the promo code for gmail? I’m just starting a cosmetics business and this has been very helpful! so can anyone send me your promo code so I can create Google Apps account as info@, company@, etc? Does anyone here know if Google Mail for business has a replied to indicator or marker like Outlook does. We have made the switch to gmail and will over 100 emails every day or two, not having a replied to marker makes email sorting very difficult. Any advice please. Hi Siobhan,\n Thanks for reaching out. Google Mail does not have the traditional indicator or marker like outlook, but you are able to use labels to help you track them. Check out this helpful Guide. Hi we have started small company which provides design service for customers ,their about 6 employees.we are planning to choose gmail for our professional email,we looking for promo codes . 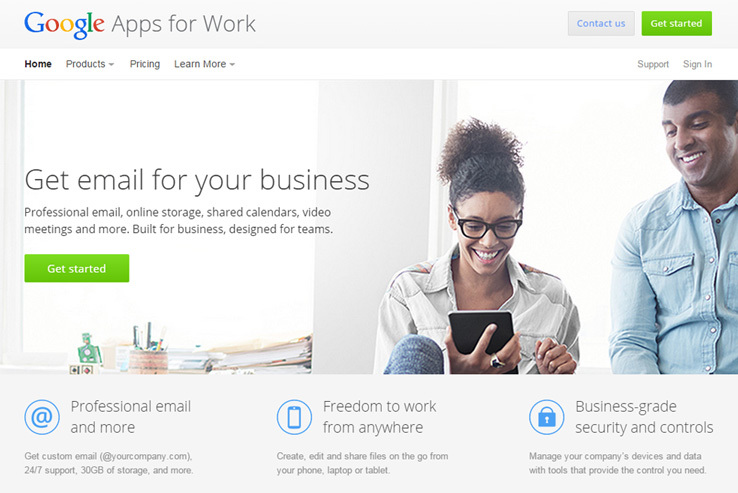 Thanks for reaching out, please email at googleapps@nimbusthemes.com and I can get you one.